As I have mentioned, I am going to be a guest-author in a 7Day Wonder holiday in Girona in September. 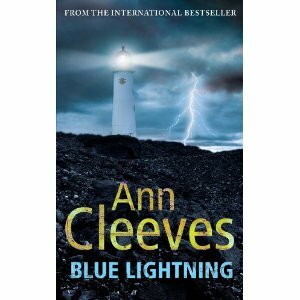 When I read the list of other guest authors I was delighted to see that award-winning crime writer Ann Cleeves was also going to be there and her book Blue Lightning, last in her Shetland Quartet, is one of the books under discussion. I read this recently, and hugely enjoyed it, and so I asked Ann a few questions about her writing (and life) which she has kindly answered below. I am also excited to see that her Northumberland books are being filmed for ITV with Brenda Blethyn, who is one of my favourite actresses - a very enticing combination, and a series I am very much looking forward to seeing. Ann grew up in North Devon, but lives now in North East England. Before writing full time she worked as a bird observatory cook, an auxiliary coastguard, a probation officer and a library reader development officer. She writes two crime series - one set in Shetland featuring Jimmy Perez and one set in Northumberland. Raven Black, the first novel in the Shetland Quartet, won the CWA Gold Dagger in 2006. It was adapted for radio 4 earlier this year. The Northumberland books are being filmed by ITV with Brenda Blethyn as Vera Stanhope. CD: Blue Lightning has an impressive plot. Please can you tell me how you arrived at it. AC: Umm, I'm not quite sure! I never plot in advance. I knew I wanted to take my central character, Jimmy, and Fran back to Fair Isle for the final book of the Shetland Quartet, and I knew it would be set in the autumn, so I just flew them in on a stormy day and developed it from there. I write traditional crime fiction partly because I'm not very good at plotting. I don't have to worry about it because the structure is already there - there's a murder at the beginning of the book, a limited number of suspects and a resolution. That gives me the space to explore the topics I enjoy - families, the affect of place on character. CD: The setting is very important to the book - how did you settle on Fair Isle? AC: I know Fair Isle very well. I dropped out of university and went to work there as assistant cook in the bird observatory. That was 35 years ago and I've been visiting ever since. 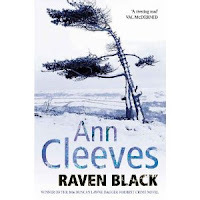 The first Shetland book, Raven Black, was about belonging, and what it is to be an outsider. So I made my series detective a Fair Islander. Although the island is part of Shetland, most Shetlanders have never been there, and Jimmy Perez with his strange name and his different upbringing would be considered a little unusual. CD: The hobby of twitching is also important in the book. I was very impressed with how this was brought in - it was really very effective. Did you have to do much research? AC: My husband is a serious birder. We met on Fair Isle. So no, I've lived in that world for a long time, while never quite understanding it. CD: The structure of the novel reminded me a little of Agatha Christie's (which from me is a big compliment). Is she an influence? Or do you have any other crime novelists that you much admire? AC: I admire Christie's ability to make the reader turn the page. She's a great storyteller. But I preferred Dorothy Sayers as a Golden Age detective novelist. Now my reading passion is crime in translation. I love some of the younger Scandinavians. CD: This seems to be the end of Jimmy Perez's career as a policeman. Do you miss your characters when you finish writing about them? AC: I'll definitely bring Jimmy back! Although BL marks the end of the quartet, I've finished the book so I can explore him and Shetland in a new and slightly harder way. CD: Another of my favourite characters in the book was Dougie. Is he primarily an invention or is he based on anyone? AC: Dougie's character was invented. But his name - Douglas Barr - was donated by a Glasgow lawyer. I held an auction of a character name to raise money for Vaila's Fund, a charity in Shetland that raises money to allow young people to travel. It was set up by friends in memory of their daughter. She was 16 when she died after cancer. CD: What aspect of your previous life (before becoming a writer) do you find most useful as a crime novelist? AC: For Blue Lightning, I suppose it helped to have been an observatory cook! I had great fun writing the kitchen scenes. I can still make scones in my sleep! More generally, when I was a probation officer, I had the freedom to ask a lot of intrusive questions of strangers - very useful. And I did meet murderers. AC: No, I know nothing about snails. AC: Professionally it was winning the Gold Dagger for Raven Black. AC: I was diagnosed with breast cancer when I was in my early thirties. Oddly, the understanding that I might die quite quickly took away my earlier fear of death. AC: My daughter lost a baby. AC: I'd be less bossy. AC: My husband bringing me a cup of tea in bed - he does it every morning. AC: Make more tea then write. In my pyjamas at the kitchen table.